Alongside other purchases, I bought a set of 8th Edition Tactical Objectives for the new Warhammer 40,000 rules. The quality of these cards is high. Or maybe I just used to play with dilapidated playing cards too much when I was younger? They are easily shuffled if needed and dealt out with ease. That said, these cards are matt finished, rather than anything else. I might grab some of my old Magic:The Gathering card sleeves for these cards perhaps in order to improve their longevity. The design of the cards is very functional. This ranges from their rounded corners through to the rules themselves and the pictures on the (sub set of) cards that illustrate their point (or are gratuitous space marines!). Now, I know that many people have a dislike to these kinds of tactical objective cards. And I for one can readily understand why. The lack of option to ditch one of these cards that is simply not obtainable is a royal pain. I would expect to see many house rules allowing players to re-draw a card that is simply not obtainable. That said, there are of course command points in play that can help a player do exactly that. So maybe its not all bad? Of course, at its base level, the cards are adding in an extra random element to certain games of 40k in 8th edition. Whether this is good as a ground levelling concept, or bad just because it is too random is up for debate. That said, I do like these cards and their implementation. I just had hoped for them all to be usable in all missions. I'm a bit late to the proverbial party on this one. But on the Warhammer community website, it has been announced that the Horus Heresy will be getting their own rules set. This is not new, of course, as we have known about it for a while. What strikes me is the replies on the Games Workshop Facebook group. When asked whether the psychic phase was going to be revised or not, there were a lot of non committal answers given. Why would this be so? Have Forge World or GW not agreed upon the rules yet? Are things in such a state of flux that straight forward questions like this cannot be answered? Or perhaps are we saving ourselves up for spoilers that will be revealed later. From what was stated though, it is clear that the Horus Heresy rules are going to be an updated version of 7th with all of the needless stuff eliminated from the set. So entries like "And They Shall Know No Fear" will likely be removed from this rule book and other rules (perhaps a full explainer of "Primarch" rules) will be inserted? In all of this, I'm somewhat torn. I do like the effort they have made to keep things in 7th at some level. But at another level, its really disheartening that the community has been split like this. I'd still like to play against Eldar using whatever set of rules we can. But should that be 7th or 8th edition? I no longer know. No one does. Until there is a 30k Eldar book released, I guess we will do what we can. Which will probably mean I write a space marine army list for my Alpha Legion. It will lack all the character that I have grown accustomed to though. Equally, this is a fate shared by 40k armies like the Raven Guard (or basically anything that isn't vanilla marines). 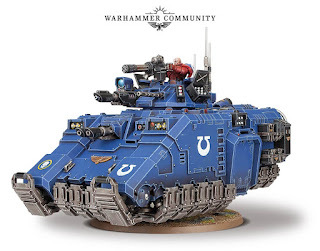 Hopefully the newer 40k codex releases will give some flavour back to these armies and I can write some kind of army list for 8th that would be an Alpha Legion analogue (perhaps based on the Raven Guard -- hence my mentioning them in particular). I decided to order a set of Games Workshop's "command dice" when I ordered my copy of the hard back 8th edition rule book. These die are a bit of a novelty thing for me if I'm perfectly honest. In the picture above, I show them fresh out of the plastic cylinder tube (top of image) that they came in. The skulls on the die in the middle of the image make it tough to see or discern the actual number being rolled in my opinion. For die, it would have been better to just use pips or a single number in a recognisable font. That said, the express purpose of these die is to keep track of the command points that one has in their pool. It is for this purpose that I'm going to give them a pass mark. The thing is, these die are very obviously different to any other die in anyone's collection. As such, they are hugely distinct. This is fundamentally what makes them perfect for this kind of "keeping tabs" usage. I will personally be using them in this manner. Most assuredly, I will never be using them for rolling purposes. The final six die (lower part of the image) are for combat statuses. They make it simpler to keep track of various things that are going on during the game and the phases that happen. I am uncertain if I will actually use these particular die. I'm a bit on the fence about them. Take, for instance, the ones that show footprints inside an arrow. The design is precisely the same as the plastic counters / markers that came out with 5th edition. I never even used the full array of counters -- particularly the run ones! Hence, my feelings about these 6 die are exactly the same that I had in 5th edition. Just a bit of a gimmick really. Hence, overall, I'll be using some of these die, but not all of them. Would be interested to hear other people's point of view in the comments or via Facebook. Most of what I'm about to put in writing has already been stated plenty of times over. Today, I wanted to chime in with an old timer's point of view. As my long term readers will be (painfully or otherwise) aware, I have been involved in this hobby since Rogue Trader days to a greater or lesser extent. Over that time period, I've seen a vast number of things change. Not just rules, but the setting as well. Back in the old days, Tau were nowhere. Necrons did not exist. Tyranids were gaunt looking things. Genestealers were beasts that lurked on space hulks and infected whole planets much as they do right now, but were not connected to the Tyranids. Unlike Zoats. They were a Tyranid slave race. Eldar were pirates. They didn't have any aspect warriors at all. Orks were orks. And some of them liked Khorne so much that they worshipped him. (some were also hyribized by genestealers). As did some of the Night Lords. The Alpha Legion might have been Slaanesh fanatics. The Iron Warriors might have been slightly too. Many people will contend that the 40k timeline has never evolved. I would agree, but with the critical caveat that it has evolved by ret-con to a strong degree. Eldar were once piratical maniacs to be feared. But now they're the seed of a new victory over the chaos gods. The necrons were merely asleep. The Tyranids were always on their way, you see. With 8th edition, the timeline has truly advanced for the first time in a long time. The return of Guilliman is simply unprecedented in all of 40k. And with him, the ten thousand year long plan that no one ever heard of, or discovered, to build better space marines. The Primaris Space marines. But they don't fit in rhino tanks much like terminators don't. Drop pod armies also seem to be a thing that is about to be dropped in to the past. The new 40k seems ripe with new possibilities. Although I am cautious about the story line being advanced significantly, I actually don't mind. I think this has been coming for a while and I approve of it. I will be looking forward to seeing where it actually winds up in the months and years ahead. Will they truly consider other sweeping moves like this? Or is it better that we all burned in the fires of Horus' ambition after all? There exist a wide variety of ways in which to design missions for Warhammer 40,000, Warhammer 30,000, Age of Sigmar, and all manner of other games. One of the defining features of the Games Workshop approach to mission design is that there is no "automatic win" button. In some war-games, the killing of the general might represent an automatic win condition and the game would stop at that very instant. This generally does not happen in 40k. Indeed, the closest thing to an automatic win is usually (but not always) a complete massacre of the opposing force. When this condition is met, the winner usually is considered to have won the "primary" mission. Arguably, they have also secured all of the secondaries and perhaps tertiaries (if they are being used) as well. But herein is the point that I want to make. If the winner in a massacre is presumed to have achieved maximum points, what about the loser? In our recent tournament, we designed it so that both the winner and the loser had things to still play for even late on in the game. For those people aiming for a massacre style victory, we awarded one additional point for achieving this goal. Hence we had some players attempting to avoid being completely massacred just for the sake of not giving away that final tournament point to their opponent if at all possible. This is a good thing and reflects not wanting to give up. Added to this, we implemented secondaries and tertiary missions that could be achieved even if a massacre victory was scored against them. The most obvious one is "Slay the Warlord". This can be achieved even if one is massacred (and obviously happens by default if one is victorious in a massacre victory!). Another is "First Strike" -- this is the same as first blood, but either player can achieve it. All they have to do is kill an entire unit in the first turn of the game. This not only alleviates the bias from achieving first blood from who goes first (which is undeniably a huge contributing factor), but gives both players something to aim for. Other examples include moving a particular unit to a particular destination during the course of a game. This can still happen for anyone who subsequently gets massacred. Hence, when designing missions, we like to frequently include at least one or two (secondaries or tertiaries) that can be scored by someone who eventually gets massacred regardless. It still gives people something to play for. Of course, there are still aspects of the game, such as having a unit in the oppositions deployment zone at the end of the game, that cannot be achieved if one is massacred. Instead, perhaps award a secondary or tertiary for moving all of ones own units out of their deployment zone (and thus score secondaries that way) rather than depend on the state of the game on the final turn. In this way, both players have things to aim for that they can achieve tournament points for during the game, and not just at the end. Meanwhile, having that extra point for a total wipe out victory will drive the win-at-all-costs player onward, and probably to distraction (as we experienced the other week!). It feels like a very long time since I pre-ordered my copy of the 8th Edition rulebook. (Note to self: it isn't that long ago really!). It also feels like a long time since Games Workshop send me their notification email that it had been dispatched. (Note to self: it wasn't -- it was totally consistent with the expectation date of dispatch!). It feels like it has been in the postal system for quite some time. (Note to self: you are absolutely correct in that assumption, even if you're wrong about the other two!). But finally. FINALLY! It is here! The shrink wrapping in the picture certainly didn't last too long, rest assured! There are a number of facets of this new rulebook that I would like to comment on. I don't think I will do it all in one post though. So today, I'm going to focus on global impressions. Firstly is the organisation of the book itself. Most of the background material is presented to the front end of the book, with a strong focus on the Imperium of Man itself. This is to be expected at some level. Yet, it does represent a deviation from some of the other core presentations where the rules came nearer to the front and the background materials to the back of the book. And of course, it differs from the 7th edition rule book that had three different volumes combine in one sturdy cardboard sleeve. I rather like the idea of having a lot more focus on the background and on the fluff side of things right up front. Being an old-timer (Rogue Trader) person, this certainly appeals to me. I just find it a pity that they could not small-font all the unit entries in to the back of the book as well instead of having several different pseudo-codexes produced alongside this (and codexes that are going to be outdated rather quickly if I'm reading between the lines correctly). That would have been much better, and probably would have harkened back to the Rogue Trader era a bit more for us very old timers! The second and final thing that I'm going to note for today is some of the photography. If I flick through the older rulebooks and search for people playing the game, they are generally (but maybe not exclusively) white males. Many appearing somewhat middle-aged. In this rule book, what is striking to me is how this has changed (for the better) to have more women visibly playing the game. Now, of course, these are probably staged photographs. But with daughters of my own who are getting in to the hobby, I welcome this change of focus away from men and encouraging women and girls in to the hobby. About (redacted) time frankly. Gaming should not be seen as a white, male, young person (possibly testosterone poisoned judging by some of the comments on various forums out there) hobby. It is for everyone who is interested. Good on Games Workshop for updated their marketing, sincerely from me. The final in the series of battle reports today from the "End of 7th" tournament we had. This time, I am using my 30k Alpha Legion forces against Eldar Ynnari, in the third match of three (following on from the Tau in Game Two). I also have a confession to make. This was the first time ever that I'd faced a true Ynnari Eldar force. I really had not much of a clue what to expect beyond knowing the mechanics of the "burst" a little bit. The Ynnari were running the following. Aspect Host Formation: 4xDire Avengers with exarch; 6xDire Avengers with exarch and wave serpent (target matrix, holo fields, shuriken cannon, spirit stones, bright lance), 5xWarp Spiders with exarch. To be honest, I was dreading facing this list. Plenty of firepower in there and nothing I can do against the psychic strength of the list either. The one thing -- and it was a very critical thing -- that I had going for me was that I managed to gain the initiative to go first. Deploying across the board, I decided that I wanted to take out the Eldar piecemeal style and target their key assets. The game objective was the simplest one possible: annihilation of the enemy. The winner would be decided by the points value of the opposition we managed to take down. Really as simple as that. Early Turns (and the flank). In the early turns, I advanced my foot-slogging veterans up the table to try to out gun the dire avengers that they had in front of them. They took several out. But they were rapidly reinforced by the jet bikes who retaliated well against my marines. A game of cat and mouse followed on this particular side of the board featuring me trying to keep pace with the Eldar and gunning them down whenever I could. The chance to charge the Eldar never really materialised, so I relied on the bolters and the melta guns I had to do the dirty work here. But it was not without significant casualties. Middle Turns (and the rest of the board). In the middle of the game, several key things happened, broadly in swift succession. The first one was that I made the mistake of killing the warp spiders with the Master of Signals. This prompted the Death Jester to spike in his burst. Its a very nasty combination that I hadn't really thought about too hard. The Death Jester shot at my assault squad, forcing them to take a morale test. Which they dutifully failed and started fleeing backwards off the table. Rallying them the next turn, I charged them toward the Jester. Shooting on overwatch, the Jester killed again. By the time I'd taken out the wave serpent with my contemptor dreadnought, he was bursting again. I really didn't think that vehicles could cause a burst, but they do. Drat. I'll remember that for next time. Hence, by the time I actually managed to get in to combat with the Jester, the situation looked grim for my assault squad. However, the thunder hammer marine was able to prevail here and finish the job finally. But it was a close run thing. The turning point in the game really only came about when I managed to get my storm eagle on to the board though. With its extra fire power, it soon started to eliminate wraith guard and shadow seer. Eldrad lasted a little while longer, but eventually Skorr claimed his head for the Legion. Not bad for the King head hunter! By the end of the fourth turn, there were few Eldar left on the table due to the fire power (and fluke die rolls that I was managing to pull off). The sheer firepower that the storm eagle was pumping out eliminated any threat to it from the board. The last few threats were the highly mobile units that were still around. My decimated veteran squad finally did the trick though, seeing off the final jet bikes and their dreaded scatter lasers to ensure that the Alpha Legion scored a decisive Massacre victory by the 5th turn. No eldar left on this world whatsoever. I hindsight, I was very lucky. Although I played my set up correctly, the fact that I went first really sealed the match up. I think if I went second, it would have been a completely different story altogether. Combined with the master of signals doing a lot of the (lucky) dirty work with the orbital blast and the storm eagle coming on to team up its firepower with the contemptor, the game was sealed by the fourth turn. However, the lessons learnt here were painful. The Ynnari burst moves thanks to the death of nearby units is immensely powerful and one that I won't forget in a hurry! There seems to have been an issue with the postal service. The issue is not quite on the scale as a certain Icelandic eruption, just to be clear. Hence, it looks like I'll be pottering around at least one more day before the new rules and everything else arrives! Gah! I want my new toys already! Going in to this match from my victory over the Salamanders in a 30k match-up, I wasn't so sure that I could do well here. The Tau have a (rightly) fearsome reputation for firepower. That said, I was confident that I could at least pull off one charge by turn 2 with my assault marines and hopefully put them on the back foot for a turn or two. That was at least the plan. The battle would be fought over the beach table with two objectives to secure. Heavy Support: XV88 Broadside (drone controller, seeker missile, high yield missiles, smart missiles). The set up is pictured below. And as a general health warning -- I took too many pictures for this one! Off screen to the right are a bunch of suits that I'm aiming to charge at early in the game with my assault squad. My heavy support are holed up in the Eldar ruins on the left and I have my contemptor with my veterans near the top left who are foot-slogging along. Luckily, I manage to get the first turn. Things start to get much more interesting in turn 2 as my assault squad enters close combat. Sadly, I completely forgot about the insane over watch that the Tau are capable of pulling off. All the surrounding squads take pot shots at my poor charging marines and whittle them right down before they can get truly stuck in to the enemy. The combat with the battle suits pictured above will go on for another few rounds as I fail to kill them on my charging turn. Meanwhile, the footsloggers are making good progress and are being supported by an incredibly lucky shooting contemptor who is really whittling the wounds off the enemy. (And I think this shot looks awesome as well, so I had to include it in this report). Despite lots of casualties on both sides by this point, the fun really starts when my storm eagle arrives and disgorges the terminators plus Skorr in to the melee. It is only at this stage that I recall the mission is to control the objectives (one in each deployment zone), so I make sure that the terminators can not only charge, but get back again to reach the objective nearby. In this game, they are classed as troops for scoring purposes due to the rite of war I'm running. The terminators try to finish off the enemy HQ, but do not succeed, and take casualties in exchange. For their troubles, the Tau HQ flies away in a hit and run effort to survive and shoot again next turn. All of my assault squad are dead now following the melee. They took plenty with them though. The above picture shows the game position at turn 4. Much carnage has occurred, and more blood and fuel are yet to be spilt across this beach landing paradise board. This comes in the form of the remaining Tau shooting my Storm Eagle out of the skies. It narrowly avoids anything on the way down, but otherwise is wrecked. 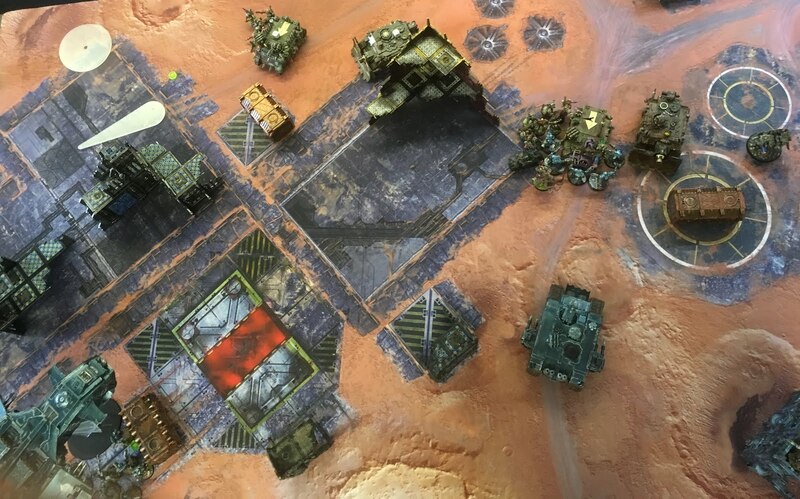 Critically, the terminators are able to slog it to the objective marker nearby, whilst finishing off the remaining Tau troops. The veterans have meanwhile perished due to incoming fire. The contemptor has only one Kheres left. The Tau make a run for it to try to claim the opposite objective. But I manage to kill most of them along the way. Sadly not enough. The game ends in a tie on the major objective: 1 objective secured each. The game ends up being decided by secondaries. I have just one more than my opponent (in terms of line breaker), hence I win. But only just. This was a very tough slog to say the least. I was very happy with the photos that the game produced, but tactically, it could have gone either way. I thought I was going to lose when the storm eagle got taken out and the Tau jetted away for the opposite objective. The terminators and the heavy support squad held on though and a draw ensued. I will freely admit that out of all of the lists taking part in the tournament, this was the one that I feared the most. No less than 5 dreadnoughts combined with the Covenant of Fire rite of war in the Salamanders legion is very strong. Those heavy flamers in the hands of the dreadnoughts are to be feared, and those melta weapons were always going to be deadly. However, the battle was to be fought over a pair of objectives -- one in each of our deployment zones. I figured that my approach here was to almost entirely ignore the dreadnoughts and instead take out the troops. That way, without any objective secured units, I could potentially still win. If I could figure out a way to stay alive. Of course, one thing that the Alpha Legion has going for it is the mutable tactics. Hence, I decided to select Tank Hunters. Combined with the Master of Ambush warlord trait, I can still infiltrate three units -- and this is exactly what I ended up doing. The Salamanders deployment was pretty much a straight line as pictured below. This provided the first opportunity for me really. I would infiltrate my assault squad and try to eliminate one of the troops squads (top right) whilst using the master of signals to take out the heavy support (bottom centre on the crates). I would then shoot the remaining squad (not shown, but located further down and left). This plan actually worked very well. By the middle turns, I was engaged deeply in close combat. However, despite my initial alpha strike (pun semi-intended), the dreadnoughts in close combat really slew my troops very quickly. However, with the good fortune to have the first turn, coupled with my Storm Eagle coming on very early in the game from reserves, the tide slightly pivoted in my direction. As my units got stuck in, losses on both sides mounted up quickly. With dreadnoughts in close combat, all of my assault squad got wiped out, and most of my veterans too. The Storm Eagle brought in the terminators to the fight and eventually, I managed to seize control of the objective on the opposite board edge. The enemy master of signals started to wipe out my missile launchers, but not before they accounted for a couple of dreadnoughts. Meanwhile my mortis managed to wreck a few of the enemy. With only a few marines left and my contemptor, I had secured one objective and was pinging away at the remaining enemy dreadnought. As turn 5 rolled around, the game was almost mine -- just one dreadnought remained to be killed. But rather than yield the massacre to me, this dreadnought went on the run behind cover to ping my storm eagle from the sky. The game ended here. I had one objective, lots of dead things (basically only my mortis and a few marines left) and the Salamanders had one hiding dreadnought. The game was won. But only narrowly and at a very steep cost. Friday saw a "Goodbye to 7th" tournament. I was playing my 30k Alpha Legion force, and I'll detail the battles in full reports later on. But for now, I wanted to show the tables that we were playing on and fighting over. Each was themed and some had a few special rules (e.g., difficult terrain in the water and nearby to deathworld scenery; fires that provide cover, but a certain distance must be maintained away from). The scenery is a mixture of Games Workshop, MDF terrain from CNC miniature scenery and TTcombat, plus various homemade items and other items. World: 1417-402. Cognomens: Isha’s Necklace. Classed as a death world by the forces of the Sons of Horus, 1417-402 has a single redeeming feature – a very large ocean teeming with moderately benign life. In comparison, its archipelagos are covered with all manner of flora and fauna widely to be considered immiscible to human colonization. Control of this world and its oceans could provide a food supply for planets many sectors removed. Ravishol is part of the 500 worlds in the realm of Ultramar and comes under the direct purview of the Ultramarines. 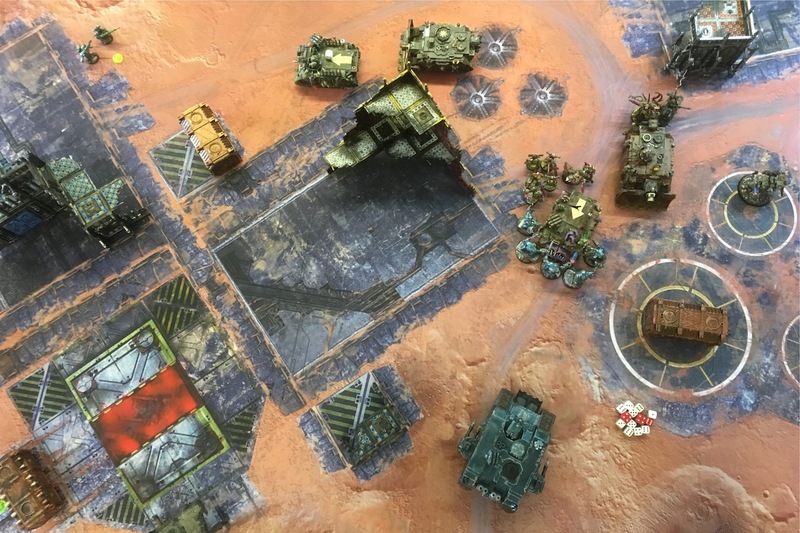 After the Betrayal at Calth, the planet came under attack from unknown forces, although reports variously suggest World Eaters, Blackshields and Knights-Errant for a similarly wide variety of reasons. Ten thousand years later, Nurgle looks to attempt to gain a foothold here too. Sent here to investigate, any would-be attacker would have to contend with the corpses of the cities that litter its surface. Discovered by an Iron Hands fleet during the Great Crusade, the world of Altruism was marked early on as a good prospect for colonization. Although at the hot end of ideal temperatures for unenhanced humans, the colonists readily took to the world and founded a settlement. It was not long thereafter that deep deposits of valuable minerals and fuel were discovered. Altruism thrived and is a prosperous, yet minimally inhabited world making it an easy target for all warlords. World: Angstrom’s Rest. Cognomens: 1772-2. (Imperial Fists). All Forge Worlds are important to the Mechanicum and offer significant resources to would be conqueres. The world of Tancredi is no exception. Sitting at a pressure point between segmenta, Tancredi was ever on the list of targets for the enemy, and for worlds to be protected by the Imperium due to its vast shipyards. Tancredi finds itself at a nexus in both time and space. The image below shows one of the large crates that Game Mat EU retails from their website. It is made of a type of resin that is heavier than the standard Forge World stuff. It also needs washing though, so make sure to undertake that step. The interior of the crate is also hollow. When I was washing mine, the inside started leaking ever so slightly and I wound up with water trapped inside the crate for days on end as I waited for it to dry through some small cracks in the (otherwise thick) resin shell. For painting, I sprayed on a black undercoat and then followed this up with a mechrite red base coat all over. The metallic hoops around the crate were picked out in gold and then everything had an extensive black wash. I then picked out some limited highlights before going to town on the scratches on the surface and the rusting (mostly a creamy orange colour). The overall effect is of a worn crate that has long since seen better days. On the battlefield, it will provide solid cover and block lines of sight. The height of this crate is more than double a regular space marine for scale comparison purposes. Looking forward to using this in our games tomorrow. The piece in the photograph below is the battlescape scenery that should feature a wrecked rhino, craters and several trees. I purchased it at a discount from a retailer a long while ago. The main reason I got it cheap was the missing component. Literally the only thing that was part of the deal was the single plastic mould. It was painted (poorly), but otherwise it was in good condition. Yet it lacked the side of the rhino, and the trees themselves. Recently I set about to repair it. Knowing that I didn't have the bits to deal with the side of the rhino, I instead opted to make the rhino appear as if it had been buried in the muck and dirt of where it had been crippled and immobilised. This was accomplished with a generous blob of filler material from the hardware store liberally used both on the underneath of the rhino and the side. I glued on a spare roof bit, and the top hatch myself that I had lying around. Painting them followed using a chaos black undercoat followed by a muddy red base colour. The stone work was picked out in old dheneb stone and layered up. For the trees, I disguised the branchless stumps with a good amount of rail way style clump tree foliage. The final ingredient (which you might not be able to pick out just by looking at it) was a true experiment. The painting of the rhino was done using nail varnish. I originally had this radical idea to use this colour on my alpha legion, but early tests didn't go so well. But, as can be seen in the image, the rhino actually looks like it has turned out okay in the end. With a new mat from Game Mat EU, I had a game of 30k vs 40k with JK last Friday. I brought 1500 points worth of Alpha Legion using the Pride of the Legion Rite of War to make my terminators and veterans in to scoring units (as it means I can take them as troops). I was using Skorr with a large blob of veterans inside a storm eagle transport and a master of signals. This was complemented by a squad of terminators riding in a land raider. A scout squad with rifles and a heavy support squad with missiles rounded out my list. More can be read about this style of list here which is essentially the same but without the transports. My opponent was using a double vindicator approach coupled with two plague marine mechanised units (with flamers, melta guns) in rhinos with havoc launchers, a chaos dreadnought, heldrake and a Forge World blight drone. Templates everywhere basically. Oh, and did I mention the chaos lord on a bike with the Burning Brand? No? Well, he also had a pet chaos spawn for laughs. Or a meat shield. Set up and Early Turns. The game was being fought over two objectives placed in the deployment zone of the enemy after regular squads had been deployed. I infiltrated my sniper squad on to my enemies as he castled up in the corner. This, I thought, gave me a tactical advantage. I had my missile launchers in a ruins on the lower right of the picture and kept the storm eagle in reserves. The Death Guard, meanwhile, were deployed in a "castle" formation with the fliers in reserves. The early turns saw some significant damage to my forces thanks to all of the templates that were going around. Plasma carnage from the dreadnought saw off a heavy support marine, and the scouts got repeatedly whacked by a vindicator and havoc launchers. The land raider came through un-scratched though. There was great carnage as the game progressed. My scouts got whittled down. My land raider moved up and disembarked the terminators to kill the rhino that they successfully charged. And the smelly Death Guard oozed out of the wreck to counter attack the terminators. The chaos lord and the spawn joined in the fun. I immobilised one of the vindicators though from the heavy support squad. By now though, the plasma dreadnought was truly whittling them down and the heldrake came on to finish a few off. I got a lucky shot in to kill the heldrake thankfully. But this did not stop the blight drone from killing off all my missile launchers a turn later. Some unlucky reserve rolls saw my storm eagle spend a lot of time off the board. But when it finally came on, I disembarked the veteran squad on to the objective in my board zone. However, the other side of the board was looking grim. My scouts had been wiped out and the other Death Guard squad sat comfy on the objective inside their rhino. The storm eagle killed the rhino, but I couldn't dislodge the rest of the squad from the objective. Meanwhile, the chaos marines slew my terminators eventually. The image above shows the near final board situation. We both have one objective each. And there is little that either of us can do to dislodge the other player from these objectives in time. The game ends on turn 5 with a draw. Both of us have one objective each. If the game had continued, I think the storm eagle might have done more damage to the death guard on the objective. But equally, the blight drone and the chaos lord on the bike would have made it to my veteran's position for some template carnage. Overall, a very entertaining, tactical game full of carnage in the middle. And -- this is not our last 7th edition outing either. There's a tournament on Friday that we'll be doing using this (and more) scenery. Just a quick note from me to say that the UK online Games Workshop store appears to have already sold out of the Sector Imperialis Objectives. That'll teach me for leaving it a little while whilst the website was temporarily unavailable for whatever reason! lol! Managed to get my order in for the core rule book now at least. Hence the waiting game now begins for the actual release date. Is it a Land Speeder? Is it a Land Raider? Is it the offspring of both brought about by mechanicum heresy development? Is Cawl a secret traitor to the omnissiah? What the? Of course, I refer to the recently announce "Repulsor". What a name it has for a start! The image above is taken from the Warhammer Community. I'm not quite sure how I feel about this new tank to be honest. On the one hand, it is really nice for the Space Marines to have something new to toy about with. On the other hand, there's a lot of other factions that could use some love right now. And, I'm not sure how this fits in to the background materials at all given that the Grim Dark of the far flung future was all about the stagnation of technology, rather than the invention of new things and combining older machines and ideas together to forge something brand new. None the less, the Repulsor appears to be joining us very soon. I think it looks a bit blocky myself, but I can see aspects of land raiders, land speeders and a few other bits beyond that in the tank. I think it looks very powerful with those las cannons ... and are they frag launchers we are seeing on the side or something else that is new entirely? I cannot quite make my mind up on that. So, full marks for surprising us still. Less marks as I'm yet to read the background materials to see how it all fits in. Somehow. Over the past few weeks, I have quietly been getting in some painting time to get a batch of scenery ready for our games. The terrain is often large scale (cities of death), but in this case, I wanted to look a bit more at some of the smaller scale items that can be scattered around to represent abandoned items and otherwise decorative pieces. These items come from both the plastic Munitorium Armoured Containers set by Games Workshop (the smaller pieces), and resin crates from Game Mat EU (the two larger crates). I wanted to try to get a rusted effect for these pieces, whilst maintaining an underlying paint scheme. Green lends itself well to this approach thanks to the contrast it makes with a relatively normative orange rust colour. Following a black undercoat, I used the death world forest green to base coat these items. A double wash followed using diluted black. I tend to favour this slightly over Nuln oil since it leaves a darker stain and makes it suggestive of being out in the weather too long. Highlights for these items were done in Scorpion Green (the closest present analogy is Moot Green). This is actually a rather strong green and can be seen clearly on the round parts of the corners of the large resin crates. Is is also on the Imperial eagle of the smaller crates to provide a contrast to the rest of the painting, but it is more subtle and watered down there. To achieve the rust effect, I used a sponge combined with orange paint to dab on in random directions and frequencies all over the crates. Some of them have been underscored in black to make the a bit more realistic. But otherwise this sponge approach to rust effects works very nicely for these battlefield debris items and it is an approach that I will be carrying forward to other works in the future.